Tucked in an unmarked industrial building in Foothill Ranch, the physicists at secretive nuclear fusion company Tri Alpha Energy believe they have moved a step closer to achieving viable fusion energy – the holy grail of sustainable energy. Their latest milestone – holding the energy levels of a 10 million degree Celsius football of plasma steady for 5 thousandths of a second – could prove to be a key step in making a fusion reaction – the same process that takes place in the sun – that produces more energy than it requires. That’s a longstanding challenge for fusion physicists, one that must be overcome before the technology can be used for commercial-scale reactors that power homes, offices and factories. Under a veil of silence for 15 years, the physicists at Tri Alpha have built their machines, run tens of thousands of tests, published more than 100 scientific papers in peer-reviewed journals and hired 150 employees. The company has raised tens of millions of dollars from private investors who range from some of Silicon Valley’s foremost venture capitalists to Hollywood actor Harry Hamlin. About 50 times per day over the course of several milliseconds, a 23-meter, cigar-shaped machine revs up, zaps clouds of gas to create two smoke rings of plasma, hurls them at each other at nearly 1 million kilometers per hour, then shoots particles at the football-shaped plasma cloud to keep its shape and energy level stable. “When we tell you we did this for five thousandths of a second, you say that’s nothing. But you have to ask how this compares to other timescales, ” said Michl Binderbauer, Tri Alpha’s vice president and chief technology officer. The potential of nuclear fusion has enraptured scientists and the public for decades, since the first hydrogen fusion bomb was detonated in 1952. It’s also a scientific field marred by hype and exaggeration. In 1989, a pair of scientists at the University of Utah held a press conference announcing they had witnessed a nuclear reaction in a jar of water at room temperature. They called it cold fusion, and announced the feat before publishing any peer-reviewed scientific papers to confirm it. Hype spread rapidly to newspaper front pages and magazine covers, but within months the scientists had been discredited when others couldn’t replicate the reaction. Binderbauer says Tri Alpha has been careful to meticulously document its progress and actively dispel any hype. Its scientists have published dozens of papers in various respected journals about technical aspects of its project. The company is only now slowly opening its laboratory doors to the media. Tri Alpha already has investors lined up for its immediate financial needs, Binderbauer said. According to public financial filings and media reports, backers include Rusnano, a Russian government-created and -owned joint-stock company whose chairman, Anatoly Chubais, is also on the Tri Alpha board; Microsoft co-founder Paul Allen’s Vulcan Capital; Goldman Sachs; and Hamlin. Tri Alpha declined to confirm who it has raised money from or how much. “We’re usually careful and we’re doing investment cycles well ahead of when we need the funds, so we don’t run on fumes. That would make the staff nervous, ” Binderbauer said. 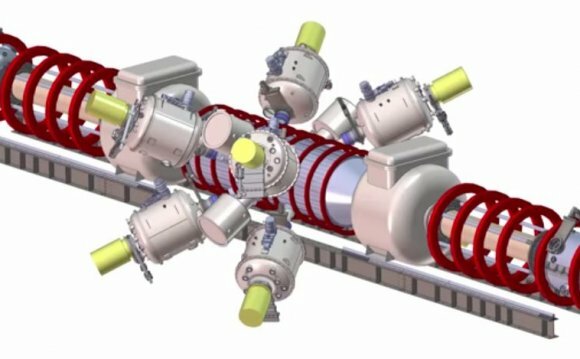 Tri Alpha is dwarfed by several government-backed fusion projects. The largest, ITER, is based in France and uses the doughnut-shaped tokamak design to which the U.S. government has devoted almost all its research dollars for the last decade and a half. ITER is funded and run by the European Union, the United States, Russia, China, Japan, India and South Korea and is meant to act as a bridge between the fusion experiments common today and a world of viable reactors supporting the electrical grid. The largest fusion machine in the United States is in San Diego County, run by General Atomics and called DIII-D. General Atomics is building the central magnet for the ITER project, a process that will take years. Stephen Dean, the president of the research and educational group Fusion Power Associates, said Tri Alpha is the largest private fusion startup today. Dean cautioned that the company still has a long way to go before creating a viable commercial source of power and notes that Tri Alpha has yet to reveal how it would scale up its tests to commercial reactor size. The company may need hundreds of millions of dollars to build the next machine to continue its research, he said. One challenge is Tri Alpha’s unusual cigar-shaped machine, whose design differs from the more common tokamak. Whereas the tokamak relies on powerful magnets to hold the plasma stable, Tri Alpha gets the same result as the plasma cloud spins and generates its own magnetic field. The spinning is aided by the particles, which are shot at the plasma at slightly off angles, and act as a shield or girdle to support the amorphous substance suspended in the steel cylinder. The purpose is to make the football of plasma so hot that the atoms slam into each other and fuse, a reaction that releases a rush of energy. But getting the plasma hot enough, and keeping it hot, requires copious amounts of energy. In Tri Alpha’s case, that’s 25 megawatts per shot, or approximately the amount of energy consumed by 30, 000 households with all the appliances running. Norman Rostoker, the celebrated UC Irvine particle physicist who died in January, founded Tri Alpha in 1998. He believed that the popular method of pursuing fusion faced a fundamental flaw. Its fuel, deuterium-tritium (D-T), produced radioactive neutrons that would eventually wear down a reactor’s housing. Rostoker set about creating a different fusion method, called aneutronic fusion. The temperatures required would be 30 times higher, but there would be essentially no byproduct. Tri Alpha’s method calls for a proton combined with an isotope of boron, a fuel called P-B11 for its fuel. Boron is plentiful, mined by the ton around the world. The largest deposits are in the Mojave Desert. Tri Alpha’s machine allows the company to run dozens of tests a day, constantly tweaking the temperature, density of the magnetic field, beam energy, beam duration, gas pressure and other variables. An advanced artificial intelligence system can take a scattershot sample of 200 variables – about 10 of which significantly affect the results. Within two sets of 50 tests, it can come up with the optimal settings. Such a large number of tests helps Tri Alpha systematically tackle problems that pose the most risk of derailing the project and cost the least to solve.